z/Scope Warp is a GUI/HTML enabled terminal emulator. Runs as a stand-alone and web-browser enabled for accessing AS/400 iSeries and IBM Mainframes under Microsoft Windows platforms. z/Scope Warp provides built-in security and connectivity to SSL/TLS enabled legacy hosts. Features include: Support of extended TN3270 and TN5250 protocols; 3270 Terminal emulation models 2, 3, 4 and 5 in both normal and extended attributes modes; 5250 Terminal emulation support in 24x80 and 27x132 screen resolutions; SCS (SNA Character String) printer support is now included, in direct, print-to-file and preview modes; IND$FILE for VM/TSO/CICS file transfer support; Friendly keyboard configuration; International character support, including support for custom ASCII / EBCDIC tables; Collapsible panel for quick access to connections, screen styles and macros; Screen styles management for fonts and color re-mapping over normal and extended attributes; Improved legibility through TN BRIDGE font, well fitted for all terminal and screen resolutions; Enhanced support for monospaced and non-monospaced fonts; Open IBM 3812/3287 printer sessions and redirecting them to your local or network printer; Pre-defined and user-defined Hot Spots, to fast operation using point-and-click actions; Runs as both a Stand-Alone Web Browser based Emulator; Fully HTML and ASP Customizeable; Multi-Session / Multi-connection terminal emulator. GTW420-Pro is a full-featured terminal emulation for VT420, VT220, VT100, ANSI, SCO ANSI and Unix/Linux. It supports Telnet, COM ports/Modem and FTP/Zmodem/Kermit file transfer. GTW420-Pro enableS you to take any document e-Mail it, FAX it or print it on ANY printer, directly from your Unix or VMS application. GTW420-Pro delivers the power of Windows to terminal emulation, use dynamic graphic background images, and display 3D Table Frames. Its FTP client automatically create macros to repeat the transfer. GTW420-Pro includes an Highly customized user interface, User-defined button bar for shortcuts, 'Tools' menu that launch windows applications from the emulation window, a flexible script language includes Script Editor and Auto Script recording, and much more. PASSPORT PC TO HOST provides TN3270, TN5250, VT100 and VT220 terminal emulation for Windows XP and Windows 2000. Features include: Small Footprint - IP-only design requires less than 5MB for the entire suite; can be run from a Citrix or Microsoft Terminal Server; offers a Visual Basic and C HLLAPI interface, as well as macros; drag and drop FTP client; TN3270 and TN5250 IBM host printing and more. TN3270 Plus is a telnet client application that connects Windows PCs to IBM mainframe, AS/400, and UNIX systems via TCP/IP. TN3270 Plus delivers 3270, 5250, VT100, VT220 and ANSI terminal emulation and 3287 and 5250 printer emulation. Advanced features include keyboard mapping, multiple sessions, macros, scripts, DDE, WinHLLAPI, LPD, FTP and SSL. TigerTerm delivers terminal emulation with VT, Wyse, ANSI, IBM 3270 and 5250 emulaiton. Features include graphical keyboard mapping, client server version, macro language, supports for both TCP/IP and serial/modem communications, file transfer including inbuilt FTP, multiple concurrent sessions, adaptable display settings including colour mapping and scalable fonts and 132 columns support. Client/server version with concurrent licensing. HOBLink Terminal Edition is a modular software suite that offers 3270, 5250 and/or VT52 to VT525 emulation, HOB Enterprise Portal for central administration and configuration, and HOBLink Secure for encryption of communication data. Any emulation you choose provides centralized session management. A single license includes connectivity for IBM mainframe (3270), iSeries (5250) UNIX/DEC/VMS (VT), and a printer client for both the mainframe and the iSeries. BlueZone supports Secure Sockets Layer (SSL). Plus, it includes BlueZone Secure FTP, which provides SSL connectivity to any SSL-capable FTP server, including iSeries, V5R1, z/OS, and z/VM. Using the Scripting Host, BlueZone can record and playback scripts using Visual Basic Scripting or Java Script. Once recorded, these scripts may be played back as-is, or edited using the Scripting Host Editor/Debugger. 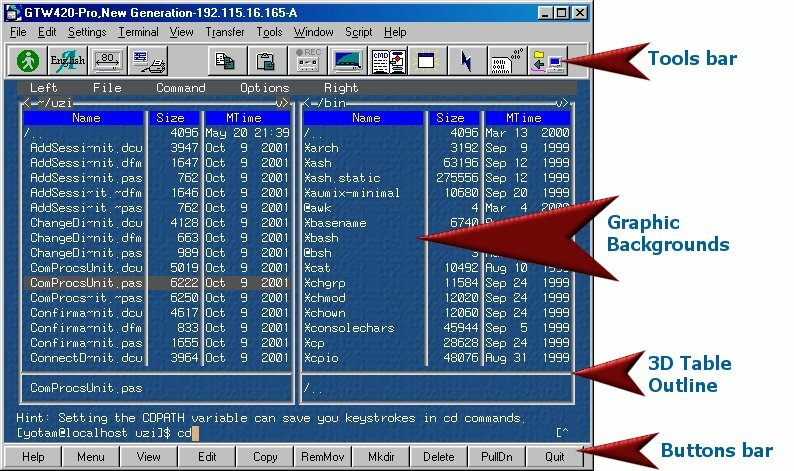 WinaXe is an X Windows environment for the Windows 95, Windows 98, Windows 2000, NT and XP platforms, enabling access to different operating systems. It transparently connects different operating systems and their applications together. You need not worry where these applications are physically located on your network. WinaXe brings remote UNIX applications to your PC with each in a separate window. WinaXe links to most UNIX hosts including Sun, Digital, Linux, HP-UX, SCO Unix, IBM (AIX) and many others. PowerTerm InterConnect for Windows is a terminal emulation program supporting the host access needs of large and small organizations. PowerTerm InterConnect for Windows offers advanced printing support, auto print mode, slave printing, and host print transfer, TN5250, SNA LU1 and LU3 support. Additionally, PowerTerm InterConnect facilitates connection to applications running on a variety of hosts such as IBM Mainframe, IBM AS/400, Digital and Unix. PowerTerm InterConnect for Windows provides a means of running legacy applications from within Windows NT/2000/XP and Server 2003.